Photo by Walt Disney World's Todd Anderson. 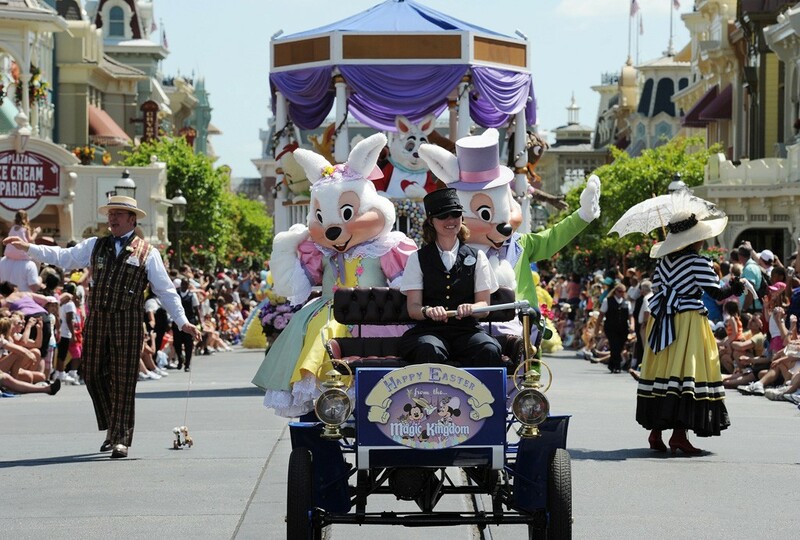 This Easter Sunday Walt Disney World will be serving up some great eats for the whole family! Cape May Cafe - Easter breakfast Adults: $30.88, Child $17.03. Easter dinner 3/31/13. Adults: $44.72, children (3-9): $21.29. Carving station, cold salads, Mashed potatoes, corn on the cob, Crab legs, Clams, Vegetable pasta, Cape May's Signature Oreo Bon Bons and much more. Captain's Grille will serve an Easter brunch 3/31/13. Adults: $30.88, children (3-9): $13.84. Traditional breakfast items such as made-to-order omelets, Eggs benedict, French toast, Mickey waffles and fruit will be served, as well as lunch fare including clam chowder, Baked macaroni and cheese, warm potato salad, green beans and salads. Desserts will be available as well. Chef Mickey's - Easter brunch 3/31/13 from 7:00am- 1:00pm. Scrambled eggs, fruits, Cereals, Omelets, Breakfast lasagna, Biscuits and gravy, Breakfast pizza, pastries, Cold salads, Carving stations, and vegetables. Garden Grove at the Walt Disney World Swan will host its annual Easter dinner buffet 3/31/13 from 5:00 - 9:30 pm. They will offer several different appetizers, soups, cold salads, and a variety of entrees including Peppered New York strip steak, honey orange glazed ham, seafood pasta, chicken vegetablers and desserts. Disney characters will entertain from 5:00 - 10:30 pm. Adults: $42.59, children (3-9): $21.29. Call 407-934-1609 for reservations. The Wave...of American Flavors - Easter brunch 3/31/13 from 7:30am - 3:00pm. Adults: $36.20, Children: $17.03. Omelet station, crab cakes, steamed mussels, grits, green beans, carving station with New York Strip Loin and ham, fresh fruit and salads, cold meats, holiday desserts. Mr. & Mrs. Bunny will be meeting guests as well (as part of Disney Park's Limited Time Magic promotion) from 9:00 am - 6:00 pm at Guide Gardens. Magic Kingdom admission required. PhotoPass photographers will be available. Activities are available for guests staying at the resorts listed below. Activities will include things such as pool parties, games, crafts, Easter egg hunts, relays, campfire and movies. Check with the front desk for times and event details. Walt Disney World will be celebrating Easter with religious services on Sunday March 31, 2013 at the Contemporary Resort in the Fantasia Ballroom. Walt Disney World strongly recommends to resort guests staying at a monorail resort to use the monorail or watercraft to the Contemporary. All other resort guests should use WDW resort transportation to MK and then transfer to a shuttle bus which will take you to the Contemporary. The Contemporary, Polynesian, Grand Floridian parking lots will be operating with parking restrictions.